This salad was a hit at the dinner party. A friend called us last Saturday very excited to invite us last minute to a dinner party. The new couple lived near us and our friend thought we’d hit it off since we had both renovated our homes. We happened to be free and excited to meet some new neighbors. But, this was the first time we’d be joining the party as vegans. What were they serving? Beef Bourguignon, mashed potatoes (butter and cream included) and cheese cake. I offered to bring a fancy salad to go with the French cuisine and warned my friend to let our new neighbors know we would love to join them, but to please not be offended if we only ate our salad. To our delight, no one had any issues with our diet and we all had a wonderful time. I made an amazing salad and got tons of requests for my dressing. Add all ingredients in blender and puree until the all mix together. 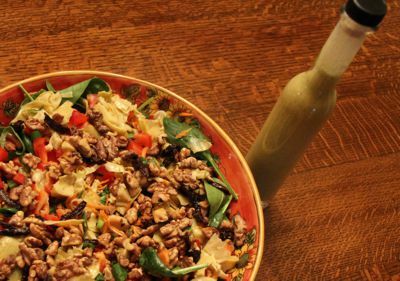 This entry was posted in Recipes, sauces, side dishes, Vegan Experiences and tagged dining with carnivores, french cuisine, salad, vegan gluten-free salad dressing. Bookmark the permalink.